Our multidisciplinary design teams deliver coordinated engineering designs that have energy and innovation at their core. On every project we aim to maximise passive design to reduce the initial carbon footprint. Highly efficient low carbon system design reduces energy even further before renewable technologies are considered. All aspects of our engineering designs are continuously challenged to ensure that they exceed brief and satisfy the needs of our clients. Our concept designs ensure that real value is added and a strong platform provided for the design to be developed. Our designers work closely with our Sustainability and Building Performance experts, using advanced dynamic thermal modelling and computational fluid dynamic software to optimise our designs and avoid over-specification, delivering environmental performance and cost efficiencies for our clients. Nearly all of our engineering designs are developed and tested in a 3D virtual environment, achieving high levels of coordination to reduce risk for our clients and ensuring that they are spatially efficient and can be installed and commissioned exactly as intended. This 3D environment is made accessible to our clients, enabling them to visualise the progress and results at all stages of the design development and allow them to comment if they wish. On every project we appoint a dedicated Project Director and Project Coordinator to provide a central point of contact to our clients, whilst managing the ever increasing complexity of multiple services required in modern buildings. Our designs are interrogated by our Facilities Management experts and Contract Managers to ensure our designs are robust and will operate effectively for their lifespan. 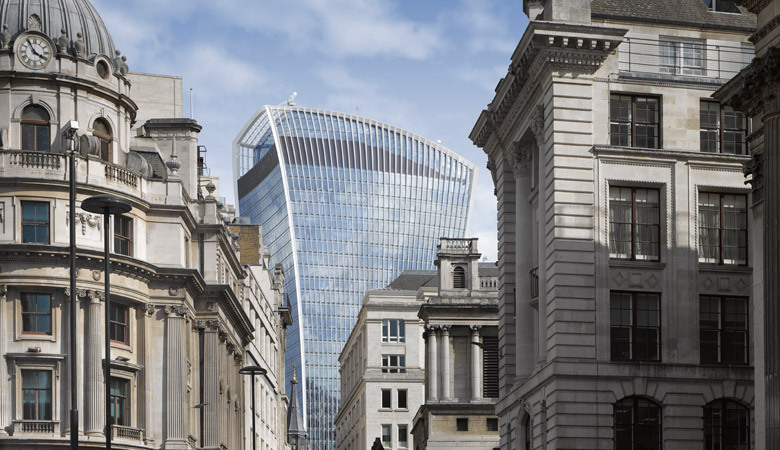 We have extensive experience in helping our clients to operate and fine tune their buildings in the early years after occupation to ensure our designs fulfil your expectations and are being operated efficiently. In all stages of our work, we consider the full life cycle of the engineering systems, incorporating appropriate adaptability to ensure future technologies and plant replacement can be carried out safely and cost effectively. 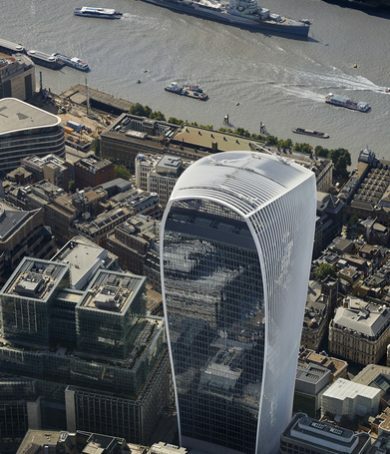 Completed in 2014 the 20 Fenchurch Street tower, designed by Architect Rafael Vinoly, has become an iconic London landmark. 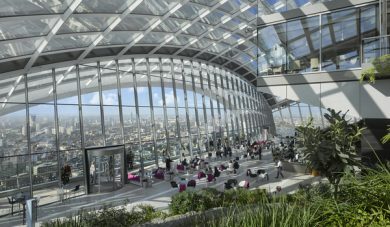 The 160m tower, with a unique inclinatory façade, provides over 63,000 sq m of prime office space over 34 floors, along with a public sky garden at the top of the building offering 360 degree views of the city. The project represents one of the largest and most complex building services design projects the practice has ever delivered. 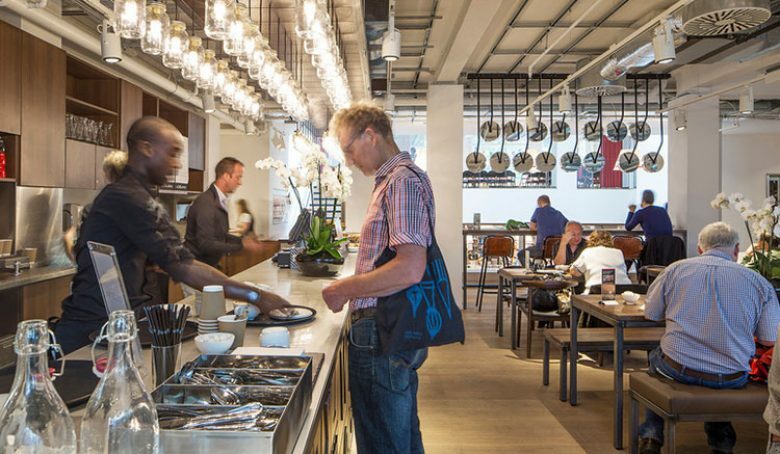 As a speculative development, an important consideration when developing engineering specifications was the need for ‘built-in’ flexibility to accommodate the requirements of a range of tenants. 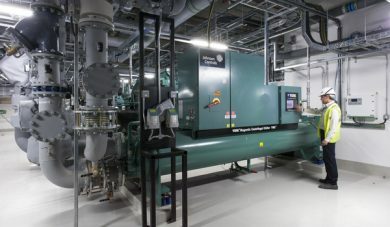 Our design therefore included provision for both Low Energy Fan Coil Unit and Active Chilled Beam systems, along with separate hydraulic on-floor circuits and space for tenant plant in an annex building. Our designs also accommodated power and cooling for on floor SER’s of up to 20kW and a MER of up to 625kW in total, allocated on a pro rata basis as required by individual tenants. 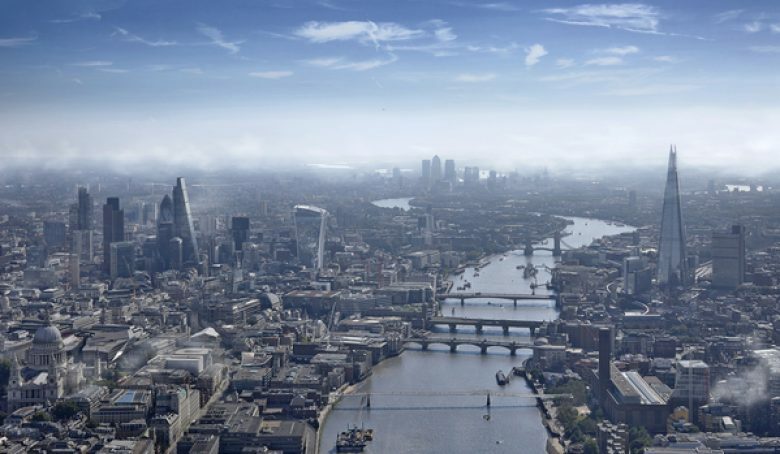 Developed primarily to target insurance, financial and professional services tenants, the integration of a comprehensive resilience strategy to support continuity of business operations was also crucial. Our engineering systems accommodated provisions for dedicated tenant UPS, duplicate tenant rising Bus Bars along with highly resilient electrical and cooling infrastructure. This included 9MVA Standby Generators, Dual 33kV electrical supplies, along with 6 chillers housed in both the main and annex buildings. 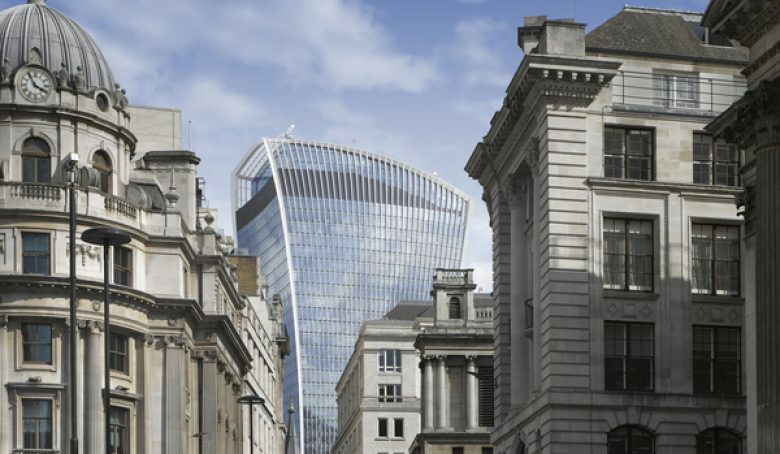 We also worked closely with UKPN to connect to a new 33Kv power network in the City of London, with the building being the first to go ‘live’ on the new system. A highly complex design, the delivery and coordination of our services design in 3D / Revit made a significant contribution to successful delivery. 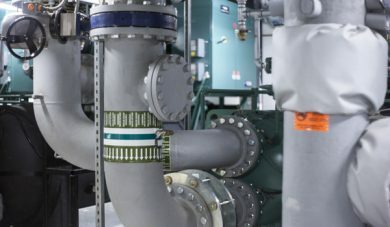 Along with drawing over 100km of pipework and 300km of cable, a particular challenge was designing the engineering systems within the constraints of the existing site. This required us to work in close collaboration with architectural and structural teams and our use of 3D / Revit was essential in coordinating and designing the M&E plant. While more intensive during the design phase, this helped to significantly de-risk the process for the client and contributed to a significant reduction in programme times. Our use of 3D / Revit also helped to improve coordination throughout all aspects of design with advised client benefits which included a 25% reduction in the project mobilisation programme and a 50% reduction in tolerances for Builders work in Connection. 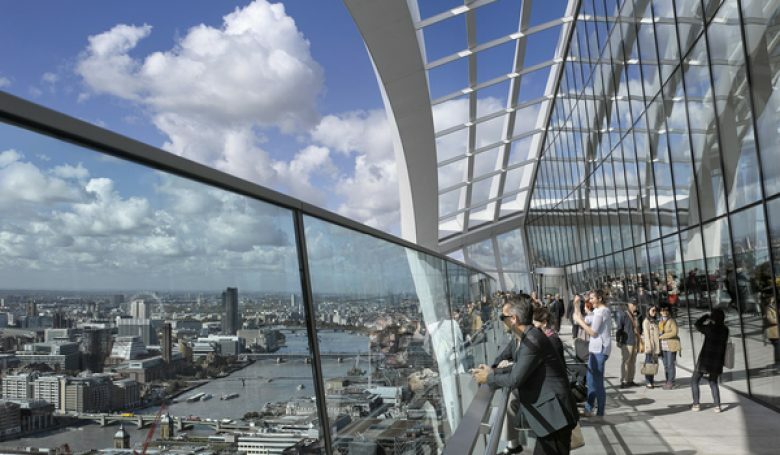 Developers Land Securities also set an ambitious set of sustainability objectives, including targeting BREEAM Excellent, and our services design accommodated a number of innovative features to support these objectives. 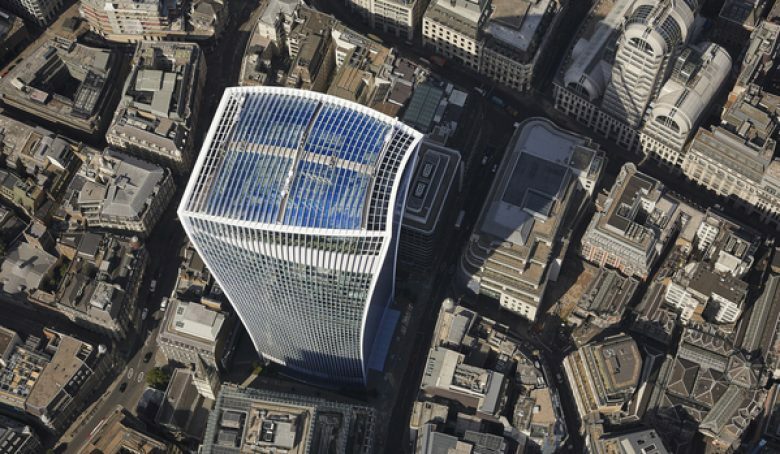 Notably, this included the first Fuel Cell to be installed in a commercial development in the City of London, providing a sustainable source of heat and electricity to the building. 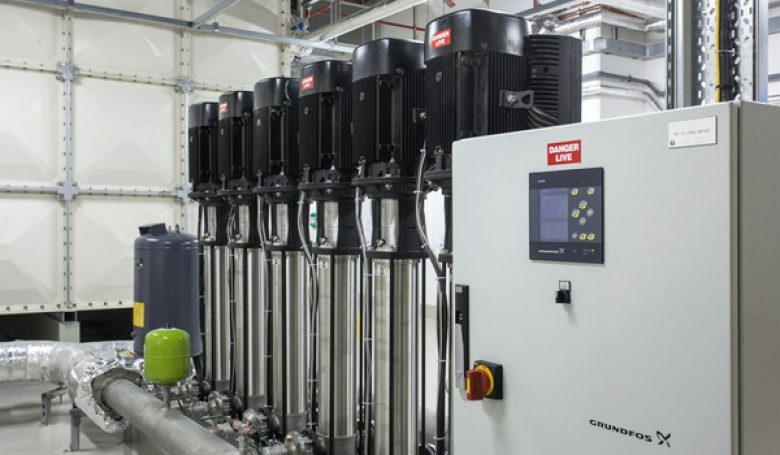 With the potential to generate 300kW of low carbon, low emissions electricity the Fuel Cell was integrated into a Combined Cooling, Heat & Power (CCHP) configuration to support the building services. Conservatively, it is estimated that the Fuel Cell will reduce the carbon dioxide emissions of the building by at least 270 tonnes per annum over the lifecycle of the building, and contributed to the building achieving a BREEAM Excellent Rating and a 31% improvement over Part L.
The project was delivered on time, on budget and is now fully let with tenants which include RSA, Castleton Commodities International and Vinson & Elkins. 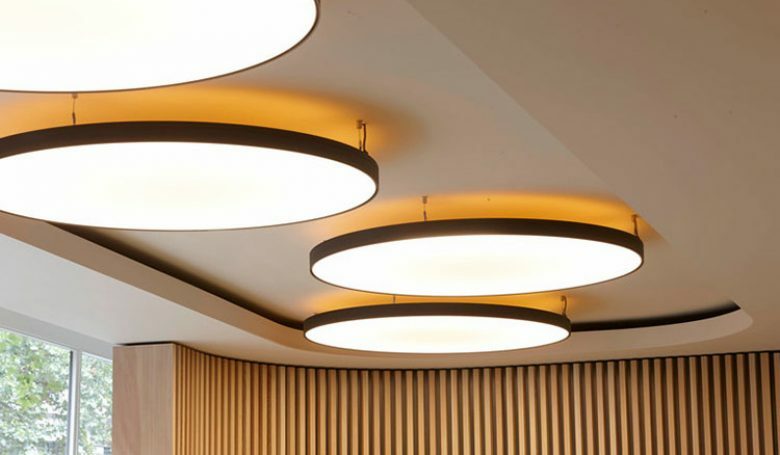 This project involved a major refurbishment of four blocks of buildings which form part of the Aldwych Quarter on the Strand in central London. Originally constructed in 1922, the iconic Bush House Centre Block is Grade II listed, including Art-Deco interior finishes, and had previously spent 72 years as a home of the BBC World Service. The remaining blocks and Melbourne House were built between 1929 and 1930, clad in Portland Stone. The site is located within the Westminster Conservation Area. 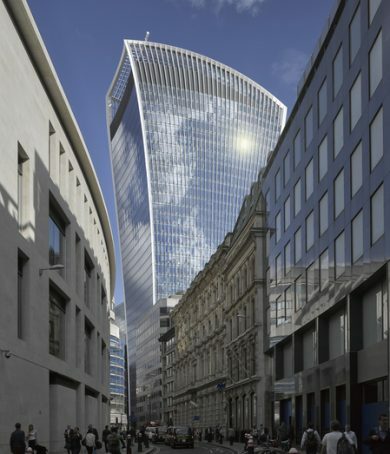 The project required us to carefully balance the need to provide energy efficient building services to support modern commercial office space, with the restrictions of the architecturally renowned buildings. 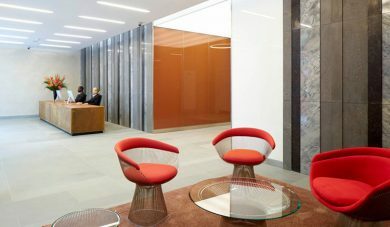 Initially, this involved working closely with John Robertson Architects to develop a refurbishment strategy to meet British Council for Offices (BCO) standards for elements which included riser allocations, ventilation, heating and cooling capacities, and electrical power, along with a strategy to maximise floor to ceiling heights. 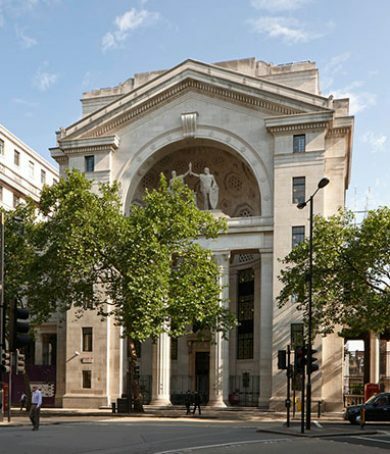 These initial strategies helped secure a Listed Buildings consent for changes to Bush House Centre Block, along with successful planning for each building, including a change of use for the Centre Block arcade from retail to commercial offices. We subsequently developed the scheme’s detailed design and developed a number of solutions which, despite a transformation of the building’s use, minimised changes to the building fabric and were balanced with careful measures to conserve the heritage of the building. 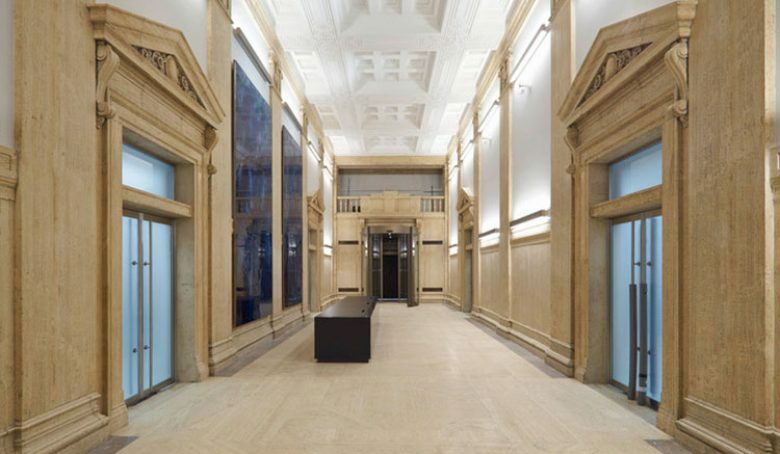 This included the extensive refurbishment of the Centre Block Art-Deco listed finishes. Notably, in order to meet floor to ceiling height requirements within the constraints of the existing structure, we developed a solution for an ‘extra slim’ fan coil unit. This allowed ceiling heights to be maintained while simultaneously providing the comfort conditions required for a modern commercial environment. Another example was the incorporation of a high degree of flexibility to help ‘futureproof’ the buildings, with engineering systems in each building allowing for both single and multiple occupancy. We designed separate building services systems for each block to enable them to operate independently, allowing future tenants to have full control of the building while giving the client the ability to sell any of the buildings in future without the need for costly redesign or rework. 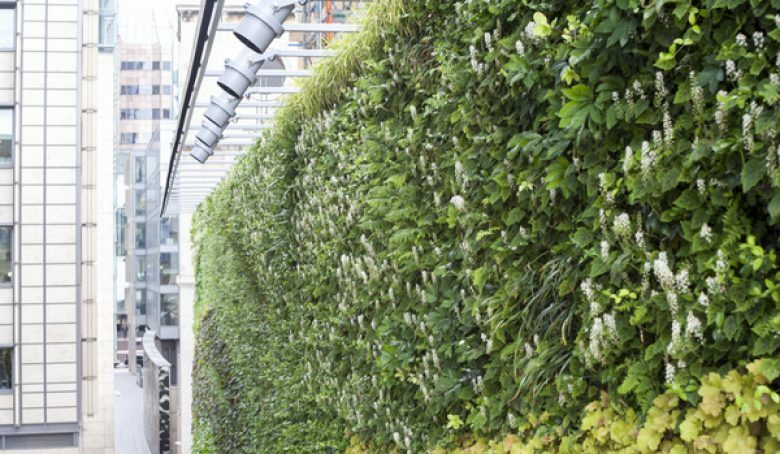 Our design was also underpinned by a ‘whole life value’ and sustainable design approach driven by a client need to reduce operating, energy, and maintenance costs, and reduce CRC liabilities (Carbon Reduction Commitments). The building services systems comprised efficient, low energy solutions, with the energy and carbon emissions being considerably lower than building regulations Part L, helping to provide a significant reduction in energy costs. 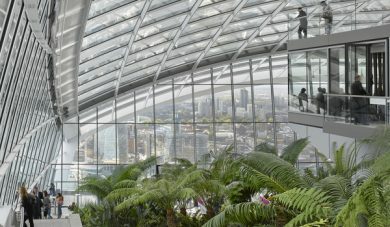 Three of the buildings achieved a BREEAM ‘Excellent’, with the fourth building achieved a BREEAM ‘Very Good’. 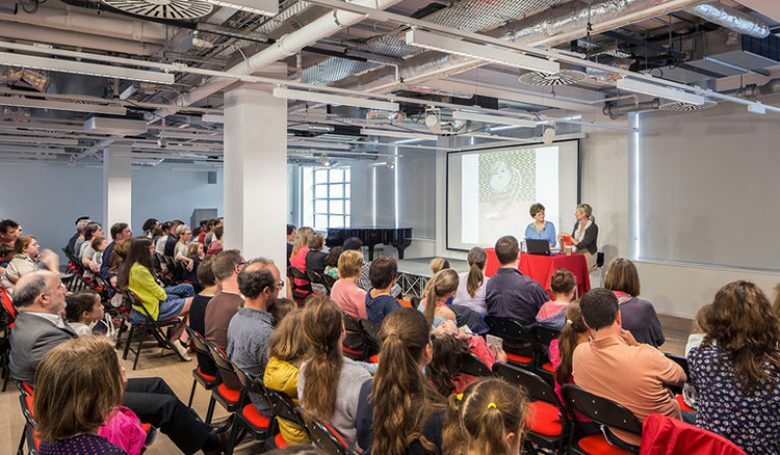 The refurbishment was completed in 2014 and we were subsequently appointed to support a major fit out of part of the site for King’s College London (KCL), converting from a Cat A commercial office to academic / educational use. 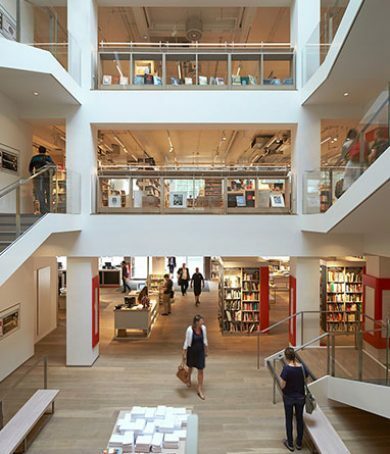 Located in the former Central Saint Martin School of Art in London’s West End, this mixed-use development is now home to Foyle’s flagship bookstore, with 37,000 sq ft of retail space spread across four floors, along with 13 high specification residential units on floors four to six. 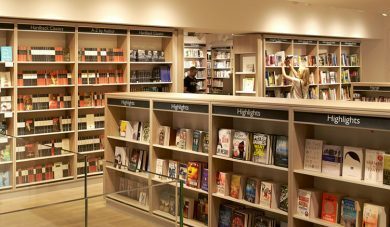 Initially appointed to support a successful planning application for the redevelopment, our commission was extended to include the fit out of Foyle’s new flagship store. 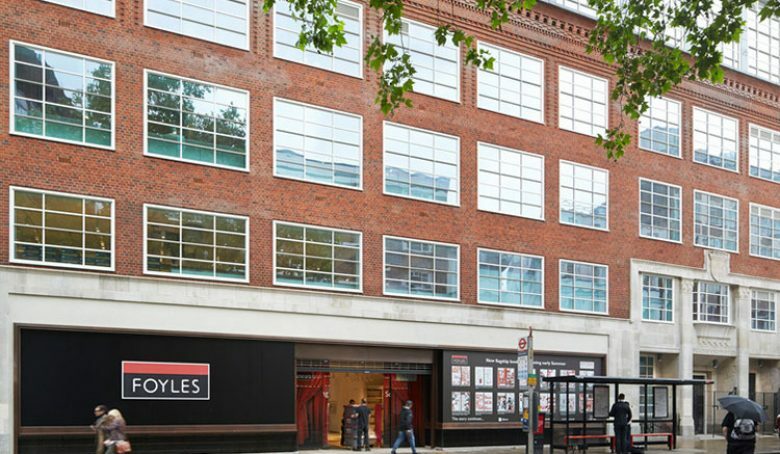 The store is close to Foyles original home, which opened in 1906. 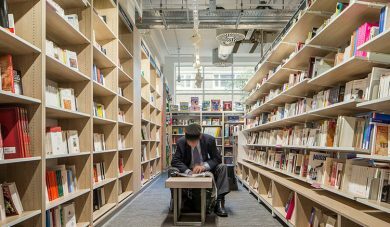 It is the largest bookshop to have opened in the UK this century, housing a range of over 200,000 different titles across 4 floors of retail space. 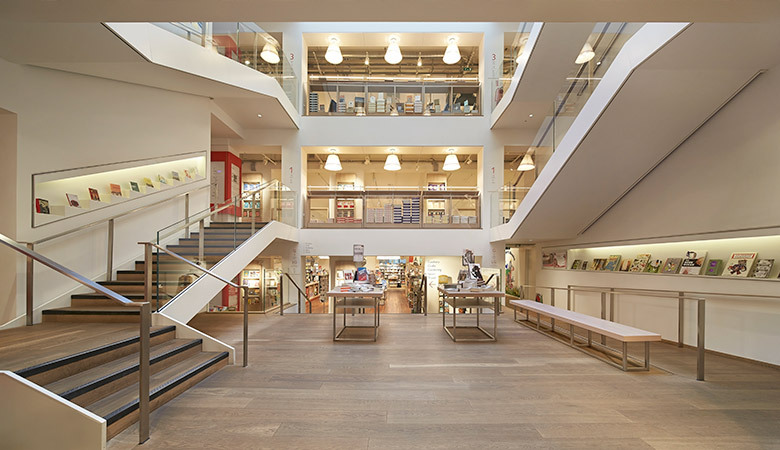 When developing the engineering services design, there were a number of challenges associated with the change of use from art school to bookshop. A notable example was the constraints imposed by low ceiling heights. This required extremely careful coordination of services – such as heating and cooling – and we worked closely with the architectural team to develop a creative solution. 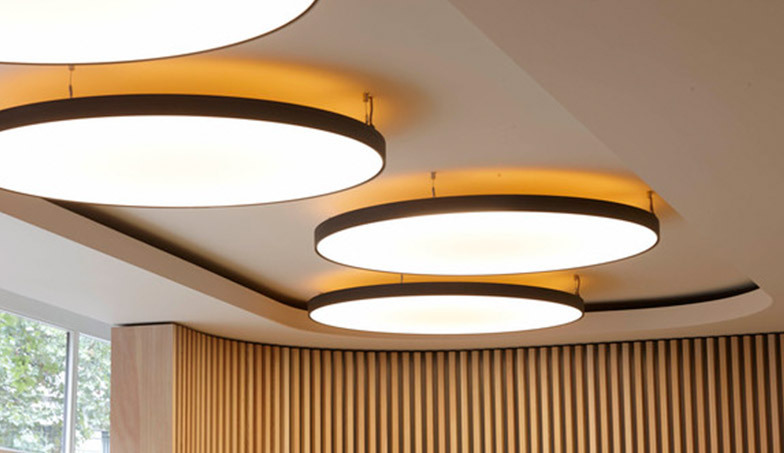 Rather than concealing the services behind a suspended ceiling, which would have reduced the spatial quality of the space, the services remained exposed to view – helping to maximise floor to ceiling heights whilst creating a dramatic aesthetic impact. 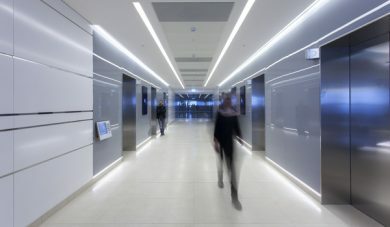 Our design also incorporated a sequence of lighting tracks hanging below the mechanical services, incorporating the latest low glare LED light fittings, adding to the visual impact of the services installation. 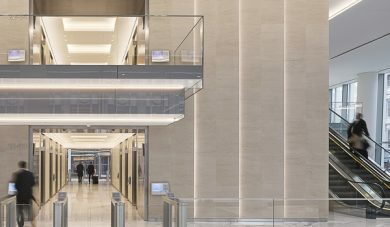 In order to achieve the client’s aspirations for sustainability and energy efficiency, the building also features a retained façade that was thermally upgraded with new high performance windows, as well as exposed thermal mass, enhancing comfort and helping to smooth the temperature swings as crowds of visitors enter the store throughout the day. 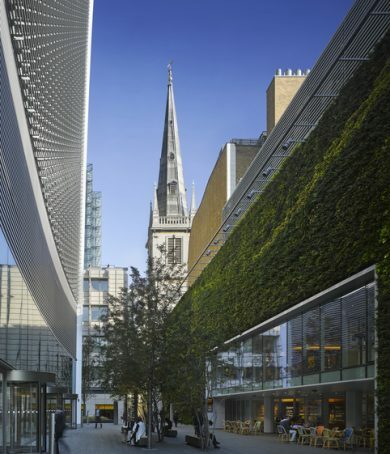 Air source heat pumps were also incorporated in our design to provide low carbon heating and cooling to retail spaces, along with a large PV array and green roof. 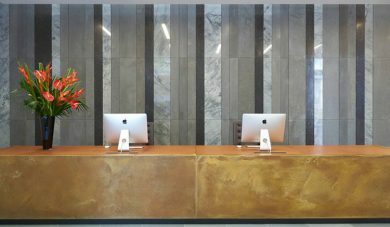 To achieve such high standards of construction, thermal performance and internal finishes, we worked closely with the project architects, Liftschutz Davidson Sandilands, to ensure both the architectural and client aspirations were achieved. 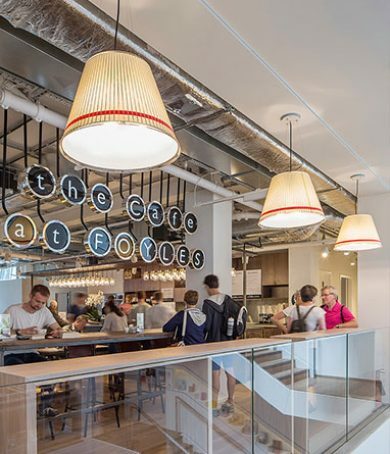 The result was a fit out which has provided Foyles with an energy efficient, visually striking, award winning space to serve as its new Flagship location.